Below you can read about all those who have helped the International Keratoconus Academy of Eye Care Professionals. Bausch + Lomb is dedicated to partnering with eye care professionals to meet the needs of patients with challenging visual conditions. Through its Specialty Vision Products division, Bausch + Lomb offers a variety of finished custom specialty contact lenses and lens care options along with extensive education and training resources, in one convenient place. Look to Alden Optical’s innovative designs in custom soft and GP scleral lenses and Unilens’ quality custom soft multifocals to meet your patient needs. Bausch + Lomb Specialty Vision Products is committed to education and provides fitting videos and academic guides on lens options for irregular corneas. Alden Optical®, now part of the Bausch+Lomb Specialty Vision Products group, is dedicated to helping you solve your most challenging fits. With a comprehensive portfolio of specialty lens designs to choose from including Zenlens™, NovaKone®, ASTERA Multifocal Toric™ and HP Toric, you have the tools and support to ensure successful fitting. NCLE-advanced certified and real world experienced fitting consultants are always available to support your fitting as is our industry-leading policies such as EZ-Exchange. Alden’s sole focus is as your preferred partner for specialty fitting. For more than 121 years, OCULUS has been a partner for eyecare professionals around the world. OCULUS provides support for the challenging daily tasks these specialists encounter by developing sophisticated technology-based instruments of the highest quality and by providing them with excellent in-service training for these instruments' efficient operation. The demanding expectations of our customers are important in every OCULUS undertaking and the satisfaction of these demands is the goal for individual instrument development projects. SynergEyes is the only advanced-technology and OD-led contact lens company focused exclusively on the leading independent eye care professional, providing a complete continuum of specialty contact lens products. Brands include Duette® hybrid lenses for astigmatism and presbyopia and UltraHealth® hybrid and SynergEyes VS scleral lenses for more challenging corneal conditions. 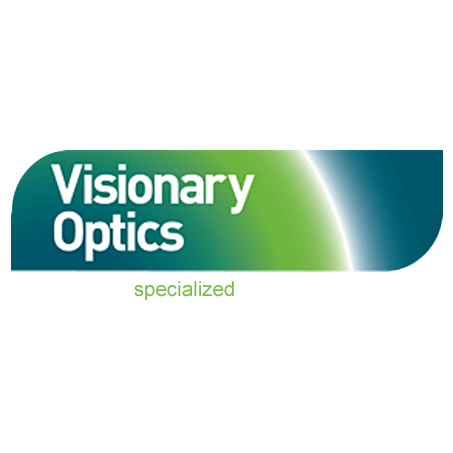 Visionary Optics is an innovative, technology driven leader in the scleral lens industry. Our Europa, Elara & Jupiter Scleral lenses are used to manage corneal irregularity (Keratoconus, Post-Surgical, Post-Refractive) & Dry Eye/Ocular Surface Disease. We co-developed the sMap3D Instrument which takes the guesswork out of fitting scleral lenses – making the process more data-driven and efficient with less chair time and remakes. We can make even the most challenging fits possible with our customizable designs and dedicated and experienced Consultants. We don’t just consider ourselves a custom contact lens manufacturer, we consider ourselves your partner. We understand that for long suffering visually challenged patients, finding the right path to improving their condition can be filled with detours, bumps and even u-turns. But the destination remains the same – to improve the quality of life through better vision. We assist you in the most challenging cases through a commitment to education and training for you and your staff, along with the widest selection of contact lenses in the industry designed precisely to ensure proper fit, visual acuity and all day comfort. We are truly your business partner and believe the patient in your chair is our patient, too. As the nation’s leading producer of custom contact lenses, Art Optical has a clear commitment to serving specialty fitters and their patients. With an extensive portfolio of industry-leading designs including Ampleye Scleral, Renovation Multifocal, our signature AKS (Art Keratoconic System), the world-leading ROSE K series, and Intelliwave and Kerasoft IC customized soft lenses, we solve complex fitting problems for a wide array of refractive errors including myopia, hyperopia, astigmatism, and presbyopia, and we specialize in irregular corneal conditions resulting from post-surgical situations, Keratoconus, PMD, and other corneal ectatic disorders. Our team of professionally certified fitting consultants is easily accessible and always eager to help, and we back our exceptional quality & service with comprehensive training resources and protection programs. Contamac is the world’s largest manufacturer of contact and intraocular lens materials, and a leading innovator of specialist polymers and biocompatible materials for medical applications. We are proud to have spent over 30 years working with lens manufacturers and eye care practitioners to truly make a difference to people’s lives. Optovue is dedicated to the advancement of high-speed OCT and OCT Angiography technology used to facilitate the diagnosis and management of eye diseases. Optovue's exclusive Epithelial Thickness Mapping is the first non-contact, quantitative measure of the corneal epithelia and stroma that helps doctors evaluate early ocular surface changes in patients with Keratoconus and Dry Eye. With Optovue, you have the choice of OCT systems to fit your practice setting, as well as comprehensive on-line education, on-site clinical practice development resources and free software updates to keep your technology current. Say goodbye to the discomfort and inconvenience of contact lenses, and say hello to Tangible™ Science, a new kind of company dramatically improving the contact lens experience for eye care providers and patients. Its breakthrough contact lens coating – Tangible™ Hydra-PEG – is designed to improve wettability, lens surface water retention and lubricity, while minimizing deposits and lens fogging for custom scleral and corneal lenses. Tangible Hydra-PEG enables eye care practitioners to better satisfy patients by increasing their wear time and comfort. It also allows them to focus on building their practice, rather than refitting the same patients and dealing with lens returns due to wetting problems. The Tangible Science family of products is built around this novel coating, and will soon include the daily cleaning and monthly conditioning solutions, Tangible™ CLEAN and Tangible™ BOOST, in addition to disposable lenses. Learn more at www.tangiblescience.com.